Guidance to make sound decisions! Large or small, almost every adult has an “estate,” which means	that estate planning is important for just about everyone. Your estate	includes all of your assets—from checking and savings accounts to	vehicles and furniture. An estate even includes claims which you may have	against third parties. If you die intestate, which means that you did	not create a will, the laws of the state will dictate what happens to	your estate. Whether your estate is minimal or substantial, it’s	important to consult an estate planning attorney to ensure that your wishes	are carried out after your death. Individuals who live near The Woodlands,	Conroe, and Spring can rely on the legal team at The Law Offices of Andrew	J. Bolton, Esq. for effective estate planning guidance. 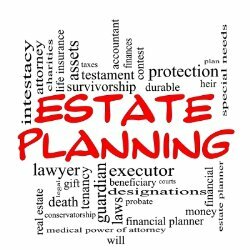 Estate planning is the area of law that deals with the management and disposal	of a person’s estate (his or her property and possessions) in the	event of his or her death. Naturally, estate planning is completed well	before death in order to ensure that estate plans are drawn up exactly	to his or her stipulations. Will: The will is a written document that identifies beneficiaries of specific	assets. A will cannot distribute all types of assets, however, such as	jointly held real estate and life insurance benefits. The will may also	designate a legal guardian for minor children of the testator. Executor: The testator of the will designates an executor, who is charged with	entering the will into probate court, settling outstanding debts, and	distributing assets to the heirs. Probate Bond: This is a de facto insurance policy against a breach of the fiduciary duties of the executor. It protects the heirs from being deprived of their inheritances because	the executor has committed a fraudulent act. Probate: The process by which a will is proved valid and the estate is administered. Trust: This is an legal creation which holds assets for designated beneficiaries. In certain cases, setting up a trust can minimize estate taxes where taxable	estates are involved. Disability: Making final arrangements isn’t the only reason to speak with a	probate lawyer. Many people neglect to plan for the possibility of long-term	disability. A lawyer can create a living trust and a power of attorney	document, which take care of your affairs if you are unable to do so. Updates: Your estate planning needs can evolve over time. When significant life	circumstances occur, such as divorce, remarriage, or a death, it’s	time to visit your lawyer again to make a new will. Estate Tax: Often, individuals fail to take advantage of strategies that minimize	estate taxes for their heirs. A lawyer can prevent this costly mistake. Here at The Law Offices of Andrew J Bolton, Esq. our legal team has over	20 years of experience handling estate planning for clients across The	Woodlands, TX and beyond. In addition to estate planning services for	individuals, we also offer specialized estate planning services for business	owners to ensure that issues such as ownership, resources, and responsibilities	are allocated exactly to your specifications. To learn more about estate	planning services, and to schedule a complimentary consultation with our	legal team, contact	our law office in The Woodlands at (936) 755-4443 today!